There are great wines, and then there are deeply emotional wines. 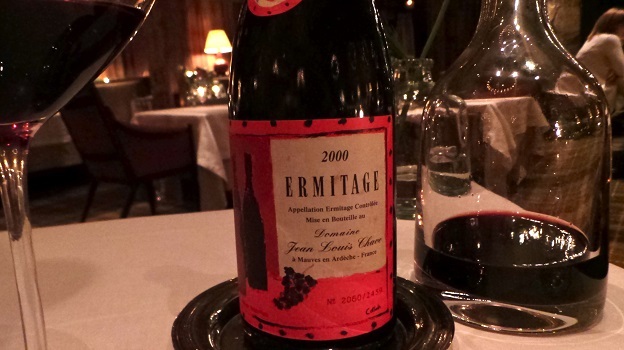 Chave’s Ermitage Cuvée Cathelin often falls into the latter category. On this night, the 2000 is utterly mesmerizing. Still deeply tannic and structured to the core, the 2000 needs quite a bit of air to soften, but the sheer purity of its fruit is striking. The flavors are bright, brisk and refreshing, with gorgeous floral and savory undercurrents that add complexity. After a long day of leading seminars, I promised myself I would go light at dinner, but the 2000 Cuvée Cathelin is simply too profound to resist. In fact, the two of us have no problem polishing it off. Readers fortunate enough to own the 2000 should plan on giving it at least 2-4 hours of air, although ideally, the 2000 should be cellared for another five years. In the meantime, resisting the temptation to open a bottle will require a level of monastic discipline that will elude most mortals. As spectacular as the 2000 Cuvée Cathelin is, it is likely to be even better in another few years. Memories of the sublime 1991 I had a few months ago linger as we finish the last drops of the majestic 2000. 98+/Drinking window: 2019-2040.